After a dramatic six months of vigorous immigration enforcement at the Mexico border, U.S. Customs and Border Protection is expected soon to release the full fiscal year's border apprehension statistics. Projected numbers, said Everard Meade, director of the Trans-Border Institute at the University of San Diego, show about 370,000 people were apprehended at the southwestern border in the year ending Sept. 30. That would be down from a high of 1.6 million in 2000. "We're down to a quarter from peak," Meade said. "There has been a steep downward trend for the last 15 years or more. It's transcended a conservative eight-year administration and a Democratic administration for eight years. It is bigger than politics. This is not about Trump." President Donald Trump campaigned on a promise to build a wall along the border and in April his administration enacted a "zero tolerance" policy on illegal migration, which resulted in separated families and the rise of a "tent city" to house migrant children. Based on figures through Aug. 31, the number of illegal border crossers are at levels unseen since a low point in the early 1970s. "It is certainly far from being a national crisis," said Andrew Selee, the Migration Policy Institute's President. Selee's organization supports U.S. immigration, but it requires "active and intelligent management" to benefit immigrants and the countries they move between. 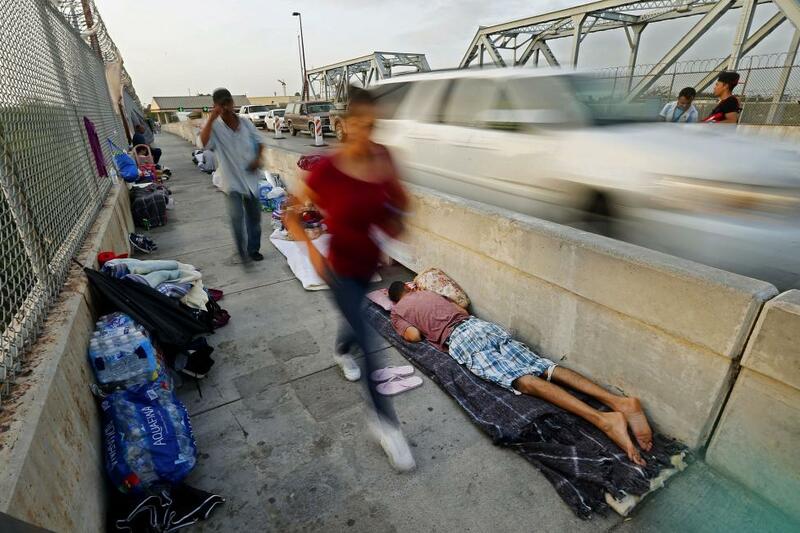 "The U.S. government has done fairly well over time in reducing the number of people trying to cross," Selee said. Jessica Vaughan, director of policy studies for the Center for Immigration Studies, does not see a declining total number of immigrants crossing the border as a sign of the U.S. government's success. "The border is still broken in many places and most definitely in crisis," Vaughan said. Her Washington-based think tank advocates lower U.S. immigration and she has urged Congress to fund Trump's border wall. Even so, Vaughan does not see the wall as the solution to this year's border flashpoints, indicating instead the U.S. asylum system is broken. "It's a policy issue. We need to fix our asylum policy, as well as secure the border," Vaughan said. "All the barriers and all the Border Patrol agents in the world are not going to make a difference. We could put up a 30-foot high impenetrable wall across the entire 2,000-some miles of our southern border and it would not help if we are still going to allow people who get in to be released to pursue an asylum claim." Vaughan said many migrants abuse the asylum system, calling it "the Achilles' heel of our security right now." The Border Patrol apprehended 90,563 "family units" and 45,704 unaccompanied children between October 2017 and Aug. 31. "There isn't a crisis in terms of the flows of migrants across the border, but there is a crisis in terms of the U.S. government's ability to deal with the kind of people coming across the border," Selee said. Official statistics show today's asylum seekers fit a different demographic profile than earlier migrants. Where once the border crossers were mostly young Mexican men seeking work, many of today's migrants are younger, with many more women and children -- accompanied and not -- fleeing violence in Central America. "Our asylum system wasn't built for the volume of people who are seeking asylum at the border," Selee said. "Our border policies weren't built to receive minors or families with children that need special protection." Meade points to a contradiction between border enforcement and the asylum system: "The Refugee Act has been on the books since 1980. It has helped hundreds of thousands of people get protection in the U.S. It says to people we offer asylum as a form of protection." The United States grants asylum to people fleeing violence based on persecution around five categories: race, religion, nationality, membership in a particular social group and political opinion. But Meade said the border is organized around the logic of deterrence, and this means "the whole system seems designed to prevent people such as asylum seekers from being able to access it." The United States spends around $20 billion a year on border enforcement, Meade said, but only a fraction on adjudicating asylum seekers' claims. The Department of Justice Executive Office of Immigration Review requested $428.2 million in fiscal 2017. EOIR runs the nation's immigration court system, including the adjudication of asylum claims. "The system is broken when you have to wait five years to get a substantive hearing in an asylum case, even when you have all kinds of data that you will face torture or murder if you return to your home country," Meade said. Vaughan agrees the asylum system is broken and that wait times are part of the problem because asylum seekers are released into the United States to pursue their claims. "The broken asylum system is creating a crisis, especially in some of the communities where folks are settling," Vaughan said, "They are going to established communities where there are other Central American families, often with a lot of people there illegally, and so they are able to survive and work and live here without any consequences even if they have no intention of pursuing their asylum claim or complying with a removal order ... That's the real crisis right now." The Transactional Records Access Clearinghouse at Syracuse University compiles data about the actions of the federal government, including immigration enforcement statistics and the backlog in processing asylum claims. TRAC reported recently there were 764,561 immigration cases, including asylum applications, awaiting a decision in August, noting a 41 percent increase over January 2017, or 542,411 when Trump took office.